A fresh salsa created in small batches that is authentic with every mouth watering bite. A homemade taste like no other. 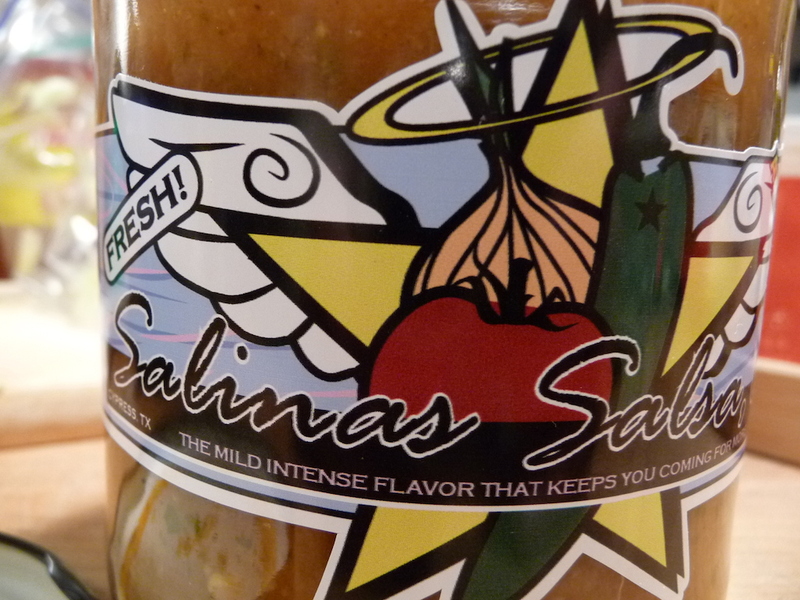 Salinas Salsa, Co. is heating up Texas and beyond with their line of super fresh salsas. They are winning awards like the 2014 Worldfest People’s Choice Champion for Salsa Challenge. 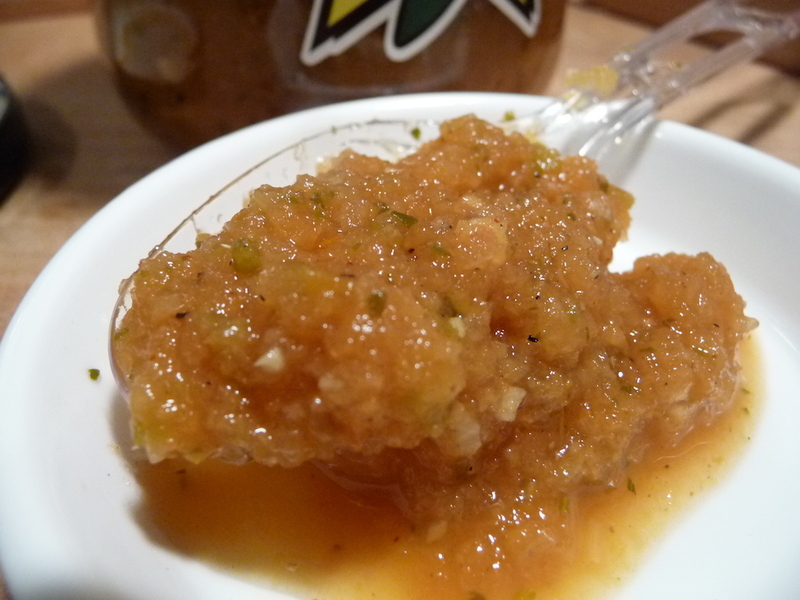 This first review of 3 salsas begins with their “Mild Angel Hot” salsa. Salinas Salsa Mile is orange in color but green in flavor with cilantro and jalapeños and serrano chiles. Ingredients: fresh variety of tomatoes and onions, cilantro, fresh jalapeños & serrano peppers, lime juice, garlic, olive oil, vinegar, fresh herbs and spices & sea salt. Small, chunky texture is satisfying. Texture & Appearance: 5/5 – Beautiful bright salsa with a medium grind texture. Remarkable for the consistent size of tiny chunks of tomatoes and chiles. I love the “chew” factor and crunch. Superb. Taste Straight Up: 5/5 – Big taste of tomatoes and onions – almost like a “pico de gallo” flavor, without the big chunks. The garlic flavor is there, with the vinegar in the background with a fresh lime taste supporting the bright flavor of the chiles. The serrano peppers bring their own unique flavor without an overpowering heat. Classic. Heat Level: 1/5 – The heat in Salinas Salsa Mild would appeal to everyone from Mom and Dad to Uncle “Chilehead” Ed. Just the right amount of heat and flavor to please everyone. Satisfying. Label/Graphics: Very classy with a “cut-out” designed label, but a bit on the dark side with the fonts. It’s hard to read from a distance, but the shape is recognizable once you become familiar with it. Original, but hard to read. On the plus side, the label doesn’t cover up much of the jar, so the contents are easily seen. Innovative. Salsa, salsa, salsa. Red, red, red. That’s pretty typical, isn’t it? 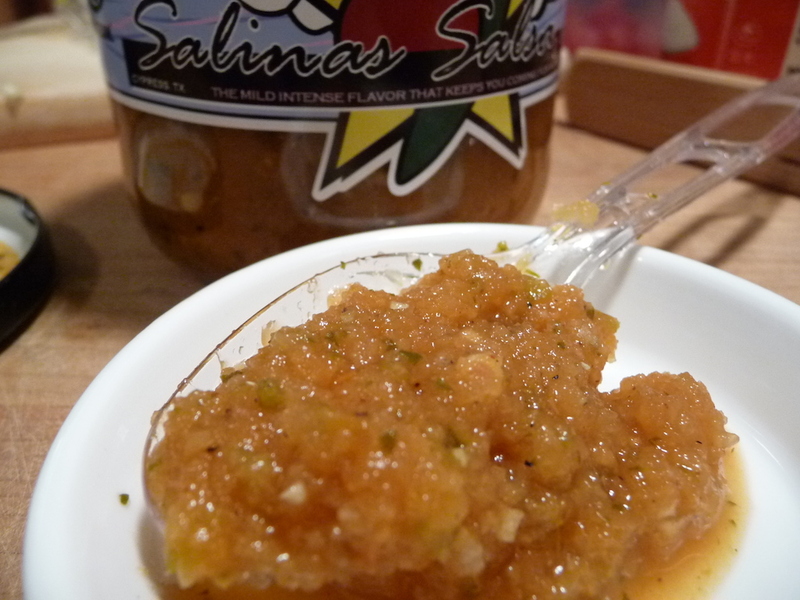 Salinas Salsa Mild is a green tasting salsa with a bright orange look. It is incredibly fresh tasting for a jarred salsa. It is truly green only in flavor and concept. Highly recommended. Made for chips and dipping. 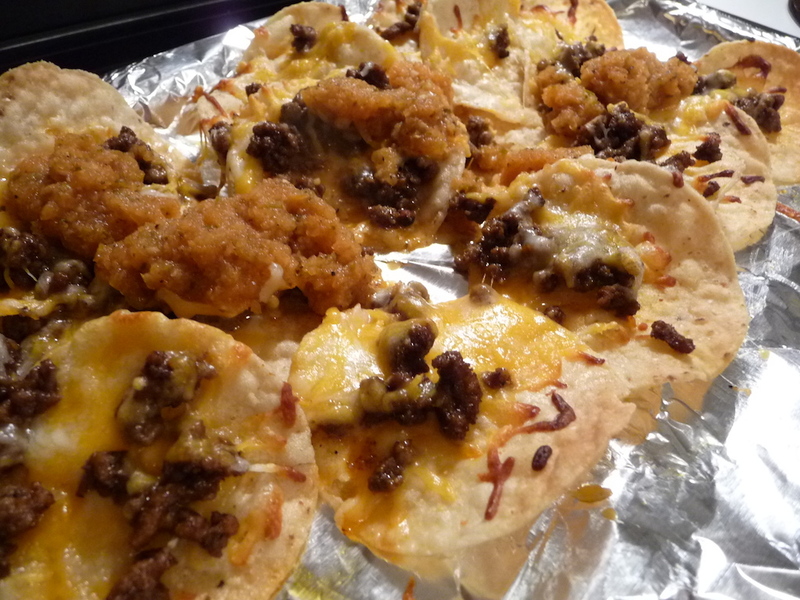 …and heated some up on some nachos with taco meat and cheese. Delicious. Perfect on nachos anyway you like them. 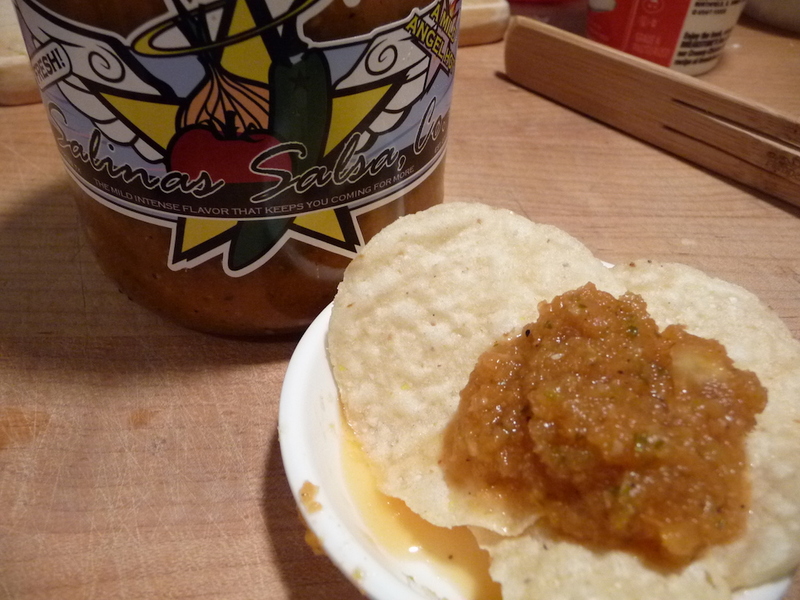 Stay tuned to our reviews of the other Salinas Salsa Co. offerings – That’s Good Hot, and Hunter’s Habanero Hot. Salinas Salsa, Co. is from the founder Eliseo ‘Shane’ Salinas, Jr. – created to make a natural homemade taste & spicy blend to match the flavors he grew up with. This a natural homemade taste that infuses Texas & Mexico together to give you the authentic taste and feel of the deep TexMex south. Social Media: Follow Salinas Salsa Co on Facebook, Salinas Salsa on Google+, and on Twitter. Where to buy: You can visit http://salinassalsaco.com/ to purchase all of their salsas, and as usual, please tell Shane that HotSauceDaily sent you. If you are a fan of Salinas Salsa Co., please let us know in the Comments below. Are you a fan of green salsas? What do you like in a salsa? We want to know that too! I absolutely LOVED this salsa! It has the crunch and flavor of really fresh ingredients normally found only in refrigerated products, The tomatoes blend nicely with the onions and peppers in this fine grind, so you’re not saying to yourself, “Oh, there’s the tomato… and there’s the onion” etc., when you take a bite. This may not have a lot of heat if that’s what you’re craving, but the flavor is spectacular! I want to thank Brian Meagher with HotSauceDaily with his review of our (Salinas Salsa Co) “A Mild Angel Hot” salsa product. We really appreciate the positive feedback you gave us on our mild salsa. Very in-depth with the descriptions on all the traditional senses – sight, taste, smell and touch (with more so of the texture). I would like to saying hearing to add to those senses but if the jar top popped when you opened it then we hit all the senses! Thanks again with your excellent review from the Crew of Salinas Salsa Co down here in Cypress TX!! We can’t be more happy to get this feedback and look forward to hear future reviews of our additional salsa products. Hey Shane. You really nailed a great salsa. Can’t wait to get into the other flavors. Thank you for the opportunity! AWESOME REVIEW! We are really stoked! Thanks again from Salinas Salsa Co. I love all of the Salinas Salsas and at my house we eat ALOT of Salsa, lol. My 17 year old pretty much drinks it…so great job!! Thanks Nikki! What is their favorite of the trio? Well I like them all, my son love loves the good hot, my daughter the angel. I really enjoy the 3 different flavors. I like that the Hunters Habenero isn’t a novelty that is used just to see your friends squirm from the heat. You can actually taste the pepper. Great flavors on all 3. Thanks Drake. What a nice insightful comment. I have the other flavors on hand and look forward to them. Thanks DT for the comment and tasting the flavor of the habanero pepper. And you are right the Hunter’s Habanero Heat – salsa flavor is no novelty and you pinned it with us getting the flavors to come out as you taste along with the heat index. Its an addicting HEAT flavor that plugs into your senses that keeps you coming back! Thanks for the comment. I have to say that I really liked their labeling, it really caught my eye and I noticed myself thinking about the packaging. Great review as always guys! Thanks, Chris. Apparently they are doing well at shows in Texas. Yes, we love the texture too, Brenda. Salinas Salsa Angel Hot is my FAVORITE!!! I have it on everything!! I even pour it on chicken and bake it!!!! So good!!! If you haven’t tried it yet, you’re missing out!!!! Nina, I would not have thought of baking chicken with it – I loved it on the cheese nachos, so I’m sure it would rock on just about anything! I cannot speak highly enough about this product.